Container gardening presents you with one major headache - watering. Most container gardening ideas typically revolve around annual bedding plants. Although these displays have a certain charm they are a little labour intensive when it comes to watering. There are a number of solutions to this problem. You can mess about with water absorbing gels in your potting compost. You can set up drip irrigation systems. Or.... you can use drought tolerant plants and at the other end of the spectrum, marginal aquatic plants. Admittedly not many of these plants will dazzle you with brightly coloured flowers. They will however allow you to enjoy a few days away from home with out panicking. It is inadvisable to plant multi-species containers. There will always be one species that is more vigorous than the others. Plant each species in individual pots and then cluster the pots together. Having said that there is one notable exception. 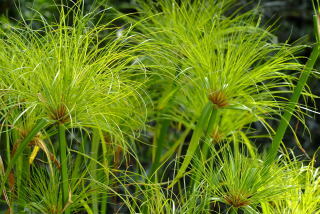 Ophiopogon planiscapus 'Nigrescens'. A small black grass like plant belonging to the lilly family. Extremely drought tolerant, it works well planted at the base of larger plants. 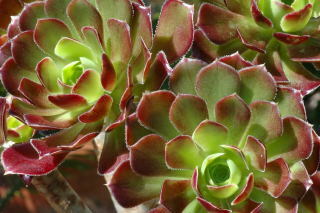 These plants would not be considered to be particularly drought tolerant if grown in the sun. 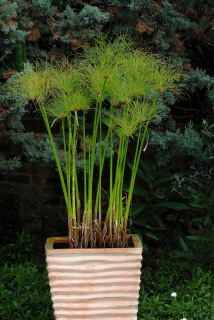 Grown on a shady patio or deck they will survive quite happily without daily watering. This may strike you as an unlikely container gardening idea bearing in mind the opening paragraph on this page. In its crudest form, aquatic container gardening could be described as any marginal plant growing in a bucket of water. The 'bucket ' can be any water holding container you desire. Most glazed terracotta pots will be water tight only requiring the drainage holes, if any, to be plugged. 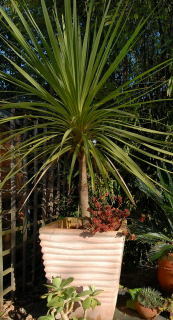 Un-glazed terracotta pots can easily be sealed on the inside and made water proof. Using un-glazed terracotta pots allows you more choice for your aquatic container gardening ideas. First plug the drainage holes. Wine corks come in handy for this purpose. Push them in from underneath. It is easier to cut off the excess cork from the outside of the pot. Seal around the cork on both the inside and outside of the pot using a concrete pond, leak fixing compound. Allow this to dry. Clean the inside of the pot thoroughly to remove any fallen leaves, dust etc. A vacuum cleaner is a useful too for this job. Apply 3-4 coats of concrete pond sealant (depending on the manufactures instructions) in a well ventilated area. This job needs to be completed in one session so allow plenty of time. Choose a sunny day and the sealant will cure faster. It should be fully cured in a few days. Give the pots a good rinse and they are ready for use. These sealing products should be available at any half decent water garden centre. If not they can be found on-line. Use aquatic pond planting baskets to plant your marginal aquatics. There are a couple of reasons for this. There will be a greater reservoir of water in the container. If the plants you are using are not winter hardy, it is much easier to remove the planting basket into the greenhouse than the whole decorative container. Removal of the plants for division is easier. The containers can be used for different plants during the winter when the aquatic plants are dormant or in the greenhouse. Most aquatic marginals like to have a couple of inches (5-6cms) of water above the soil level. To work this out :- pile a few bricks in the container. Place an empty pond planting basket on top of the bricks. 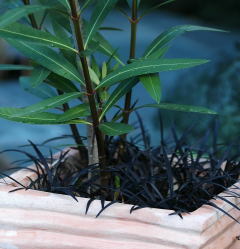 If the top of the planting basket sticks out of the top of the container, remove a brick. If it is too deep add a brick and so on until you get it right. Line the plastic pond planter with Hessian or old tea towels. Custom made Hessian liners are available that just pop into the planters. Although convenient, they are perhaps a little over-priced. Fill the plastic pond planters with potting compost. Use a 50:50 mixture of multi-purpose compost and John innes no2 (loam based compost). Do not use that horrid aquatic mud. Plant your marginals in the pond planter and cover the surface with a good layer of grit. Add the panting basket to the container. Fill the container with water. NB. Water gardening in containers does have one drawback. Still water attracts mosquitoes. Find out how to solve this problem using safe mosquito control measures. Carnivorous plants such as the North American pitcher plant and the Venus fly trap. Nelumbo nucifera (lotus) - consistently warm summer areas only.